River Belle Casino Review – Enjoy NZ$800 in Bonuses! River Belle Welcomes players from New Zealand River Belle Casino reminds users of the traditional gambling boats and while it was launched in 1997, it has modern Microgaming software and is available on different devices for a great gaming experience. There is something special about River Belle Casino and with an ongoing track record of more than two decades, it is safe to say that many players enjoy it. The style of the website is very calming and although the links are a bit dated, navigating is pretty simple and there is plenty of information about the games, the payouts, the license and more. An update would definitely be useful but the same doesn’t apply to the actual online casino since everything is up to date once signed in. Scrolling down to the bottom of the main page and we see that River Belle Casino is powered by Microgaming, the games are verified by eCOGRA and the active license was issued by the Malta Gaming Authority. The casino is not currently available in the UK, or in the United States. It is however a hit in New Zealand and in Europe, with many fans recommending it strongly. The site gets secured when in the account and the connection is also safe from the installed application. Claim your bonus of up to NZ$800 at River Belle! If you are not a fan of how the website looks or works with its link based tabs, the best solution is to register and head over to the instant casino. This doesn’t take more than a couple of minutes and can be started by following our links directly to the site. The registration process is divided into three steps and the popup windows are secure in order to keep your personal details safe. Once on the premium casino, things look a lot better and are more functional as well. The download can be started from the site since there are multiple locations for the link to get the small desktop app. The installation guide will keep things simple and the desktop icon will be ready to go in no time, giving players a direct link to River Belle Casino. Full account functionality means that the downloadable casino can process secure banking transactions and even include quick contact options for support. It is a known fact that not all casino games are created equal and Microgaming certainly has the advantage. The first thing that becomes obvious is the simply massive collection of hundreds of gaming options that the developer has built over the years and River Belle Casino offers its customers. Regardless of the chosen gaming platform, no-download or download, New Zealanders will have access to an amazing array of casino games. Slots: Known as pokies in New Zealand, it is the perfect place to start when talking about the real money gaming options. River Belle has a boatload of slots games that range from hot new Microgaming titles to the classics that everyone loves, such as Hitman, Tomb Raider, Hellboy and Thunderstruck II. Blackjack: Players who enjoy following the cards in blackjack will find more than enough variations to please them. 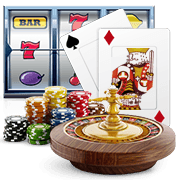 The online casino brings versions from around the world in the same category, providing Atlantic City Blackjack, European Blackjack, Vegas Single Deck Blackjack and more. Roulette: A similar variety of worldwide roulette games is available for players who appreciate the little wheel. European, French, American, Spingo, Multi Wheel and more roulette games are waiting on the site and the wide range of betting options makes them ideal for all customers. Video Poker: There is an entire category for video poker that contains a couple dozen games to make sure that all the popular machines are covered. The graphics are a bit dated to provide the authentic experience while the modern mechanics make every round fair. Live Dealer Games: River Belle NZ has added an entire live casino from Evolution Gaming. Available on a separate tab from the rest of the games, the live dealer tables come with two private options for blackjack hosted by The Palace Group, and six open tables with young and friendly croupiers. 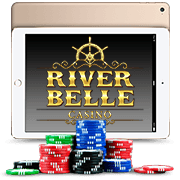 River Belle is compatible with every tablet and smartphone on the market thanks to the Flash-based instant casino that can be started by simply entering the address on the web browser. The site will change to fit the screen and once you sign in, things will get even better with more than 130 mobile casino games that have optimized controls for touchscreens of different sizes and designs. While Android, Windows and BlackBerry users can only play on the instant River Belle Mobile Casino, players who have an iPhone or iPad have the alternative of downloading and installing the dedicated app from the Apple App Store. It is free and pretty small, while featuring pokies, progressives and more. Being available on different mobile devices doesn’t just mean that players can bet real cash on their favourite games. It also allows for banking transactions and full account control while on the move to make sure that the winnings add up. With millions of New Zealand Dollars in progressives, each spin can be a life changing one. River Belle Casino starts things off with a 100% bonus on the first deposit and then offers two more deposit bonuses to keep the free money coming in for every new player. The maximum available is of $800 and this is just the start, with various other bonus offers and promotions becoming available after. A minimum deposit of 20 New Zealand Dollars is needed in order to be eligible for the welcome bonus and the three bonuses have to be claimed within 7 days of registering. Each bonus has a standard play through requirement of 50 times. This means that for a bonus of $100, the player must bet at least $5,000 before being allowed to withdraw from the account without forfeiting the bonus. There is also a limit for cashing out winnings obtained with the bonus funds and it is of six times the size of the deposit. More details about how the casino bonus offers work can be found on the website, with River Belle being very clear about the terms and conditions. Another thing to keep in mind is that the bonuses are mostly aimed at pokies players given the fact that bets on most other games don’t contribute 100% to completing the requirement. Registered players can see their loyalty status and current amount of points in the account at any time. For beginners, loyalty points are a way for the casino to reward its customers and it is directly linked to the amount of real money bets placed on the different types of games. Points are redeemable for real cash and the more points a player earns in a month, the higher the loyalty tier will be, thus adding more perks. The highest tier is Diamond and it is mostly for high rollers and VIPs. Support at River Belle Casino is available 24/7. The buttons on the main website don’t always work best and there can be some issues with accessing the pages from the top tabs. There are also some links on the bottom which are better and will show a list of phone numbers that includes a toll free option for New Zealand. Customers who are already registered can use the support service directly from the lobby or casino app to chat instantly or send e message by email from the form. A dynamic seal of authorisation has been granted to Bayton Limited by the Malta Gaming Authority. This is the company managing the online casino and the license guarantees reliable gaming on River Belle in all the markets where it is available. The MGA license is not enough for the casino to be live in UK but this doesn’t affect Kiwi users. Banking plays a big role when it comes to online casino games since customers have to be able to easily deposit and withdraw funds as they wish. 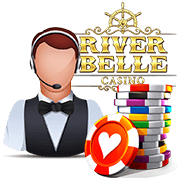 River Belle Casino has improved its online cashier quite a bit to now have many banking methods that can be filtered by country to give each player the needed means to make secure transactions. Looking at the list for New Zealand, we find that deposits can be made by using different big online payment methods, such as Skrill, Visa, NETELLER, MasterCard and EcoPayz. Bank transfers are also accepted but it can take up to 48 hours for the funds to be available in the account, whereas the other options are instant. Withdrawals first start with a pending period that lasts 24 hours. During this time, customers can reverse their decision and cancel the request. After 24 hours, it takes an average of two days for the withdrawal to be completed. NETELLER and Skrill are faster, while MasterCard and Visa require up to six business days in total. Overall, River Belle Casino combines the old with the new while keeping the best of both worlds. The design on the website is nice and can get players interested, while the latest in Microgaming software will make sure that each gaming session goes off without a hitch. The welcome package is good for newcomers and even if only the first bonus is claimed, that is still up to 200 New Zealand Dollars for free to bet on pokies. And speaking of pokies, the hundreds of gaming options with spinning reels, HD graphics and all sorts of rewarding features help make the casino great. Other games are of course included and we appreciate the variety across different platforms. The mobile casino worked great for the River Belle Casino review and we expect the developer to continue to add games to the rich collection. Taking everything into account, River Belle is more than favourable.